WASHINGTON (CNN) -- Officials in the United States are looking into the recent arrest of an Iranian-American student in Tehran who was working on a research project on women's rights in Iran. 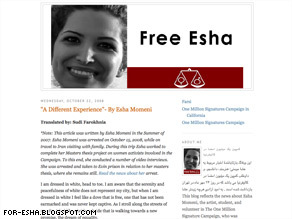 Esha Momeni was arrested October 15 in Tehran, Iran, officials said. Esha Momeni, a graduate student at California State University-Northridge, was arrested October 15 in Tehran for unlawfully passing another vehicle while driving, according to Change For Equality, an Iranian women's movement. "We're seeking additional information about this case," State Department spokesman Robert Wood said Wednesday. "We stand with all those in Iran who are working for universal human rights and justice in their countries." Momeni, who was born in Los Angeles, California, is a member of Change for Equality's California chapter. She arrived in Tehran two months ago to work on her masters thesis project on the Iranian women's movement, according to the group, which is in touch with Momeni's family in Iran. Momeni is being held in a section of Tehran's notorious Evin Prison that is managed by the Intelligence Ministry, the group said. Evin Prison houses many Iranian dissidents and political prisoners, and it is where four Iranian-Americans were held for several months last year. All have been released. Iranian officials had promised Momeni's family that she would be immediately released if the news of her arrest was not published, the organization said. "While Esha's friends and colleagues were insistent about announcing the news of her arrest immediately, based on requests from her family this news was announced with delay," Change for Equality said on its Web site. Momeni's parents decided to release the information after they went to Iran's Revolutionary Court on Sunday -- five days after her arrest -- to inquire about her case, and they were told not to return until the investigation into her case has been completed, according to Change for Equality. The Momeni family returned to Iran after the 1979 Islamic revolution, but Esha had gone back to the United States several years ago to study for her masters degree, according to a blog post from her journalism professor, Melissa Wall. A separate blog calling for her release (for-esha.blogspot.com) has been established and includes an interview with Wall, who describes her student as "an exceptionally bright person, very creative and artistic." She calls herself "shocked" to hear of Momeni's arrest. "I'm aware that such things happen in Iran, but I'm confident that they have nothing to fear from Esha's research project," Wall said. "It is simply an academic exercise, not meant for publication outside of academic circles. I cannot image why she should be held in detention." On her personal blog, Wall said, "She is a videographer who was simply interviewing Iranian women. She has broken no laws, has not done anything wrong."